The Knog Frog Strobe Twinpack is a great value safety bike light setup, to get you home. These compact and easy to fit bike lights are a good secondary light source in addition to your main system. At just 19g each, these bike lights are featherlight and can be easily be mounted to your bar thanks to the silicone strap. 4 light modes and up to 80 hours battery life are ideal for daily use. The Knog Frog Strobe is designed to work through the harshest weather conditions. These are great lights. Easy to use. However if it was now I would rather buy the Knog USB rechargeable as these you have to keep buying batteries for. Smaller than I realised but give off a decent amount of light. Very easy to fit and look neat. These lights are lightweight easy to install and bright with different settings. What more could you want Would definitely recommend. And the price on Tredz was the best I could find for the pair. Delivery was also super quick thank you. A bit pricey for the brightness you get. 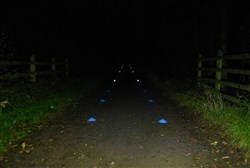 These lights are just fine to be noticed when you ride your bike at night in a city. Not only great for handlebars and seatposts these make superb helmet lights. Great visibility and light as a feather easily the best solution to being seen around a busy city day OR night! Well if you're like me and seem to scatter your bike lights to the wind depositing them at the office your friends houses in your other bag etc. etc. then these are the lights for you. Cheap as chips surprisingly tough good enough light to be seen in street areas. As someone mentioned however they do like to turn on in your bag ... Recommended if you don't want to feel to gutted when you inevitably lose them. Again. These lights are very bright and easy to install and remove.They do have a problem of turning themselves on when stored in your backpack wasting some battery. Nice set of lights that don't require any brackets. Battery life better than expected. Great price too.